Castle Bromwich’s Donovan Jones opens up on his experience with prostate cancer. Fourth February was World Cancer Day and a day that’s pretty close to home for E Block’s Donovan Jones. The day is designed to raise awareness of the various forms of cancer that have impacted many of us but Donovan wanted to use the opportunity to talk about his shock cancer diagnosis and his recovery to spread the word about the importance of attending regular screenings. The 54-year-old BIW associate has been part of the Castle Bromwich team since joining the company in 2010 and has over the years spend time in F, C and E block. The summer of 2018 was the hottest one in the UK on record, for all those working outside of an air conditioned office it was making things a little sticky to say the least. Donovan’s role in E Block involves physically demanding work within his cell anyway but the warm weather was really turning up the sweat levels. He’d tucked away a rag in his back pocket so that he could mop his brow, however little did he know that when he took off his gloves to wipe his face, he was unwittingly contaminating his rag with tiny bits of the sealant used in his process and transferring it onto his face, this soon turned into a rash. To make sure it wasn’t anything serious Donovan was advised to go down to the Occupational Health team to get it looked at. Concerned that it may be an allergic reaction the team suggested as a precaution that he went to his doctor for a blood test. This bit of advice may just have saved his life. He certainly wasn’t expecting the news that came next. “Two days later I was on my break at work when I noticed four missed calls from my GP surgery and a message asking me to make an appointment to see them immediately,” he recalled. “Strangely enough I wasn’t that concerned at first. I thought it was probably nothing and as I was at work I told the receptionist that I couldn’t get down until later in the week. Donovan arrived at the doctors, was sat down and told that the blood test had picked up an anomaly in his blood that is usually associated with prostate cancer. “Then it just hit me, I thought oh my life. About a hundred worries suddenly appear in your head all at once, what will happen to me next and will my family be okay were the main ones. Additional tests including a biopsy confirmed that he had cancer on both sides of his prostate. The good news at that point was they were confident they had caught it early, before it had chance to spread. The next step was to discuss treatment options, which for Donovan included radio therapy or an operation to remove his prostate. He clearly recalls the date his surgery was booked in. Donovan woke up in the recovery ward at the Queen Elizabeth Hospital in Birmingham to the good news that the operation had gone well and they were confident they’d removed all that they could. He was in hospital for three more days, but it was when he got home that his recovery would really begin. With the support of his family, the NHS and the MacMillan Cancer Support charity, Donovan began working hard on his rehabilitation. It was during this period that he would discover something that would both hit him hard and inspire him to tell his story in the hope that others would get themselves checked out. “I found out that my neighbour who I’d known for years had got the same thing as me, only his was not caught until the late stages and he had been given a terminal diagnosis. Ironically, Donovan had been previously vigilant and had a check for prostate cancer two years ago and at the time gotten the all clear. He knew he should probably arrange another check soon, especially as Caribbean men fall into a higher risk category than most. That thought stays firmly with him which is why he’s been telling his mates in E Block and anyone else who will listen the importance of going to get checked. Despite this he thinks only a couple have made time to do it and he’s hoping that by opening up and honestly sharing his experience in this interview he can cut through to more people and get them talking about the issue. Another thing that he thinks is putting men off is the misconception that the first thing that will happen is you’ll be given the physical examination. He wants more people to realise that the first stage is a simple blood test, as he thinks it will increase the likeness of people going. You’ll only be asked back for a physical examination if they suspect that there’s an issue. At which point that may be a little awkward but your doctor certainly isn’t fazed by it and I’m sure you’ll agree a little embarrassment is a small price to pay when it comes to potentially saving your life. Donovan has preliminarily been given the all clear, he’s now just awaiting on one last test to confirm it. He’s currently itching to get his life back to normality. We’re wishing him a speedy recovery and hope to see him amongst us at Castle Brom soon. Before we let him go we asked if he had a direct message for those thinking of getting checked out after reading this article. “Like me you’ll go about your life thinking you’re bullet proof, that you can shrug it off and that you don’t need to get checked up but the fact is that it not that simple. After reading the story, Dr. Steve Iley, Jaguar Land Rover’s Chief Medical Officer, agreed with Donovan, adding: “Good occupational health is good medicine. We should be helping to prevent and detect illness early, not waiting until someone is really sick or off work. Always see your doctor if you are worried about something that isn't getting better." 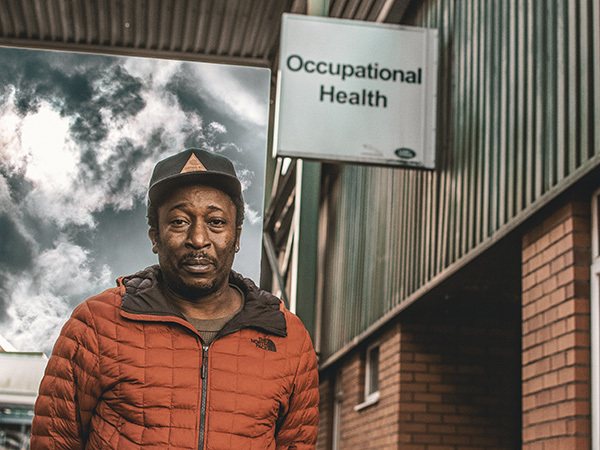 He went on to say that if you have a medical concern at work, contact the occupational health team as soon as possible, who can offer you support and guidance on what to do next. For more details visit the Occupational Health section of People Portal. Like me you’ll go about your life thinking you’re bullet proof, that you can shrug it off and that you don’t need to get checked up but the fact is that it not that simple. If you’re thinking of getting checked after reading this I’d tell you don’t put it off, just go and do it.